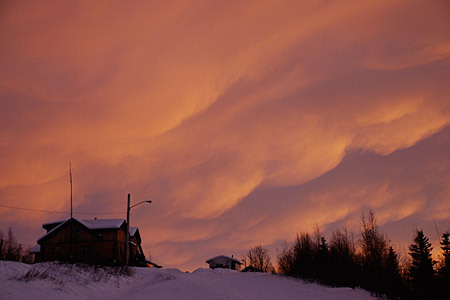 CBQM (Director: Dennis Allen): 150 kilometres north of the Arctic Circle, Fort McPherson is a small town of about 750 inhabitants in the Northwest Territories. At the heart of this community is the citizen-run radio station, CBQM. This shoestring operation broadcasts everything from music and news to bingo games and moose calling contests. Dennis Allen’s verité portrait of life in the north is grounded in the operations of the station, and much of the film’s considerable charm comes from the filmmaker’s simple observation of the details of everyday life. We eavesdrop on a wide range of DJs, including the local minister teaching a Bible lesson, an RCMP constable issuing a crime report that concerns incidents of egg-throwing, and several local characters playing live music tunelessly while the phone rings in the background. In a community as small as Fort McPherson, people often use the radio station to send messages to each other, from the simple (“good luck at bingo”) to the hilarious (“hang up your phone, I’m trying to call you.”). The broadcasting is sloppy but the earnestness of these volunteer DJs makes it easy to overlook. Allen’s cinematography is often stunning, and his generous use of wide-angle lenses conveys both the feeling of infinite space in the Arctic as well as the sense of isolation that the residents must feel. In fact, the thread present throughout the film is that CBQM is the voice of a friend to many lonely older people in the community. When winter means that the sun hardly rises above the horizon, this little radio station is a beacon to a community that might feel forgotten otherwise. CBQM is screening as part of the 2009 imagineNATIVE Film and Media Arts Festival on Friday October 16 at 1:00pm at the Al Green Theatre at the Miles Nadal JCC. This entry was posted in Documentaries, Film Festivals and tagged aboriginal, arctic, imaginenative, nfb. Bookmark the permalink. Congratulations to filmmaker Dennis Allen. CBQM just won the Alanis Obomsawin Best Documentary Award at the imagineNATIVE festival. Check the NFB site to find more opportunities to see the film. congratulations Dennis on taking the best little radio station past north of 60 all the way to Toronto and for a job well done. For bringing out the true spirit of the Gwich’in and their dedication and struggles to think of one another and to make the most of lifes struggles without thinking about the barriers that most people assume they have. once again congratulations on a job so dedicatedly done.